N.C. Gov. Bev Perdue must decide whether to sign new legislation into law after the N.C. Senate voted 47-0 to give final approval for new laws imposing stiffer penalties for those so violent that they would torture, starve, or kill an animal. The punishment could be up to eight months behind bars, but a judge could agree to community service instead. The bill was introduced after a Greensboro man received probation after burning, beating and leaving his 8-week-old puppy to die. The female pit-bull mix was later adopted and named Susie. 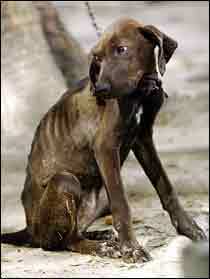 via Senate OKs stronger law for animal abuse. Update: On June 23, 2010, Governor Be Perdue signed Susie’s Law, making tougher penalties for those who abuse animals. We have all seen that person in the lane next to us texting on the phone, eating a burger, and slurping down the soda all while driving with his knees. Maybe we have even been that person ourselves. Not anymore. In N.C. effective December 1, 2009, texting while driving became illegal and is an infraction punishable by a $100 fine and court costs. No license or insurance points can be assessed for a violation. The definition of texting in the law, includes using a mobile phone to read or send electronic mail or text messages. The law does not apply if you are parked or stopped or if you are using a voice operated technology.